The above Photo is Kevin Porter's Slate Sweetgrass Tom. you can see this picture at "Porter's Heritage Turkeys" under Various color combinations. Porter's Heritage <?xml:namespace prefix = st1 />Turkeys is one of my most visited websites because of his vast knowledge of Color Genetics and the many color varieties he breeds and maintains. Last year he posted the above picture in his "Various Color Combos". When I saw this picture my mind started working on what the Slate Blue Sweetgrass was and what I had in my flock that would create this beautiful color combination. I contacted Mr. Porter and gave him a list of the birds I have and asked for his guidance in how I could reproduce the color. Sweetgrass Tom - (b1b1cgcg) Black winged bronze base color with 2 Grey (AKA) Palm genes. 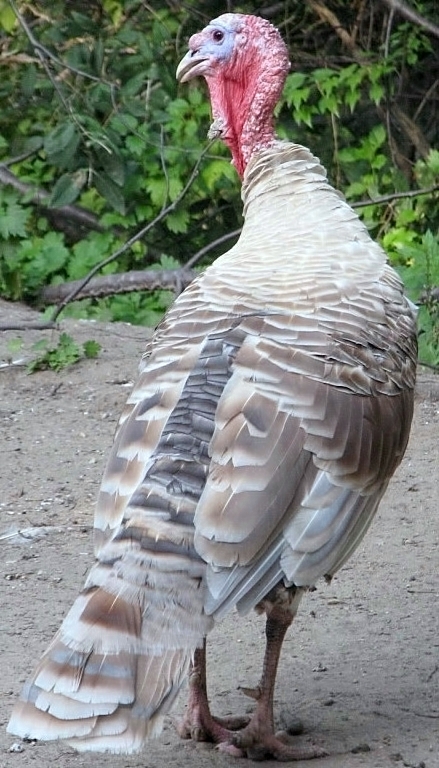 Lilac Hen - (b+b+DD) Bronze Base color with 2 Dominate Slate genes. All offspring will be (b+b1CcgDd) a combination of Bronze and Black Winged Bronze with a single grey (AKA) Palm gene and a single Slate gene. This year (2014) I will breed the F1 Hens that I keep back to a different Sweetgrass Tom. In the F2 Offspring, This will give me the following color genetics: Sweetgrass (b1b1cgcg) which will bred true, Blue Red Bronze (b+b1cgcgDd) (just like their dame) Slate Sweetgrass (b1b1cgcgDd) with a single Slate gene and look like the picture of Porter's Slate Sweetgrass along with some (b+b1CcgDd) and (b+b1Ccg).